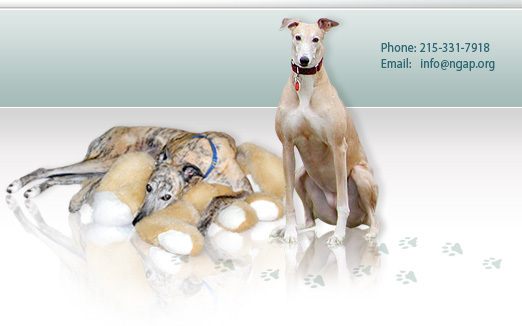 National Greyhound Adoption Program's pet clinic, Dutton Road Veterinary Clinic, is now offering a wonderful new pet identification card for all clients and new greyhound adopters. This card contains a photo of your pet with your pet's name, your name and contact information, our clinic name, hours and contact information, and your pet's medical history. This way you will always know when your pet's shots need to be updated and how to contact us to schedule your appointment! 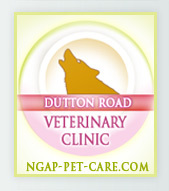 Your pet's card will be updated and reissued for free each time you bring your pet to us for new shots. After you bring your pet into our facility for shot updates, we will send you a link, via email, for you to upload your favorite photo of your pet. 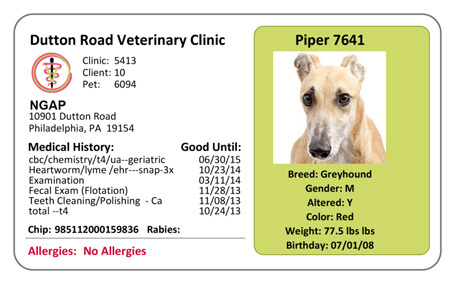 Once that is complete, your free pet identification card will be generated and sent directly to your address! Don't have a computer and/or email? No problem! For a $15.00 fee, our staff can take a photo of your pet and upload it into our system for you, OR for the same flat fee, we can upload one of your existing photographs from a flash drive or a digital camera chip. For greyhound adopters and pet owners that currently use another veterinary facility or do not meet the above requirements for other reasons, these ID cards are available for purchase for $12.50. 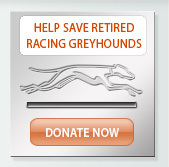 Please see our clinic receptionist for more information.